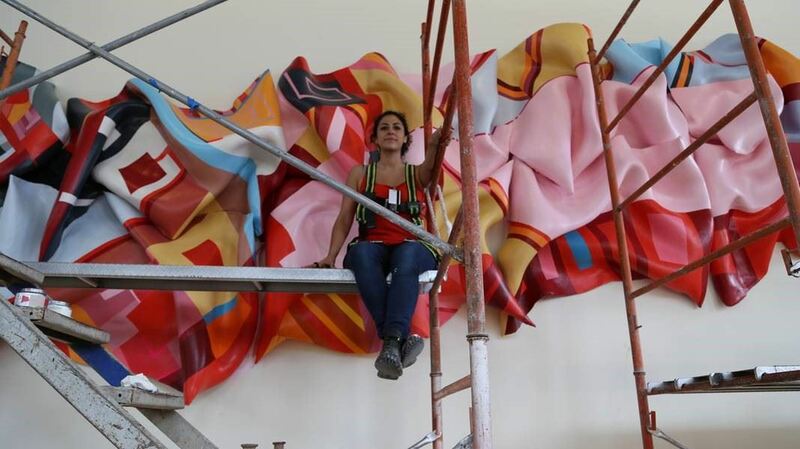 The artist during the installation of her monumental sculpture at the American Consulate in Monterrey, Mexico. Brooklyn-based artist, Marela Zacarias has opened a private studio in Seattle to create a monumental sculpture for the new Seattle-Tacoma International Terminal. Due to the extreme scale, only portions of this artwork are in process at any given time, and are currently at eye-level. Zacarias has created major site-specific works for the office of Mark Zuckerberg at Facebook Headquarters and the American Consulate in Monterrey, Mexico, among others. She received her BA from Kenyon College, Gambier, Ohio, and her MFA from Hunter College, New York. She lives between Brooklyn, Mexico City, and now Seattle, until this major artwork is completed. Read more about Marela Zacarias here. SAMS friends and guests are welcome. Registration is limited to 30. $10/person. Please arrive by 6:15 p.m. Program will begin at 6:30 p.m.
Wine, sparkling water, and snacks will be provided. Please note: Enter the two-story beige/grey warehouse through the door on the first floor, located off the parking lot of the building. Please park in the parking lot if spots are open, otherwise street parking is available in the area.